Bangalore Naatkal is a remake of the Malayalam Superhit Movie Bangalore Days. As you know, It’s a very difficult task to make a Remake of a Hit Movie successful due to high expectations. 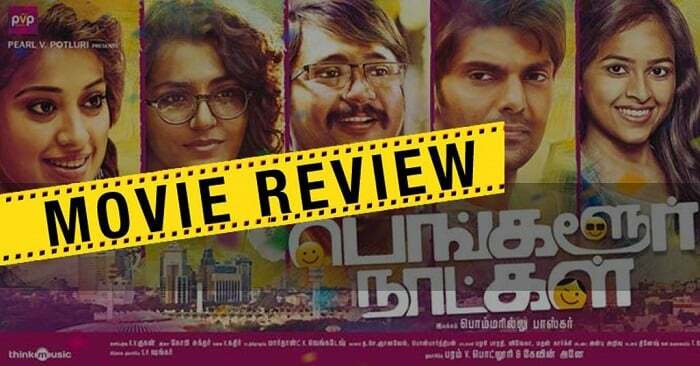 But, Kudos to the Bommarillu Bhaskar, he delivered an entertaining flick with Bangalore Naatkal. Arya, Bobby Simha, Rana, Parvathy and Sridhivya play the lead roles. Lately, a lot of Malayalam Movies got Tamil Remakes and were successful. We are sure that even Bangalore Naatkal will also join the Group. Divya (Sridhivya), Arjun (Arya) and Kannan (Bobby Simha) are cousins with a great bonding. They have a lot of fun together. Arjun in a crazy Youngster & Divya is a Chirpy Girl. They have a craze for Bangalore City. It was their Dream to go and have fun in Bangalore. Divya gets married to Prasad (Rana Daggubati) who is a no-nonsense guy and settles in Bangalore. Arjun and Kannan get a job in Bangalore and settle there. How well do they all get along? – That’s the Story! Sridhivya steals the show. Gopi Sundar’s Music is good in the Movie.